These loaded sweet potato nachos are a great twist on the classic nacho recipe. I promise you won't miss the tortilla chips! Toss the sweet potato, onion, and pepper with 1 tablespoon of olive oil. On a baking sheet, place the sweet potatoes on the bottom, then top with onion and pepper. Top with Himalayan pink salt and black pepper to taste. Place baking sheet in the oven for 20 minutes. While the nachos are baking, heat 1 teaspoon of olive oil over medium-high heat until it starts to shimmer. Add ground beef and brown. When it's close to being finished, add the garlic. Cook for an additional minute or two. Add in the homemade taco seasoning and the black beans. Remove from heat and set aside. 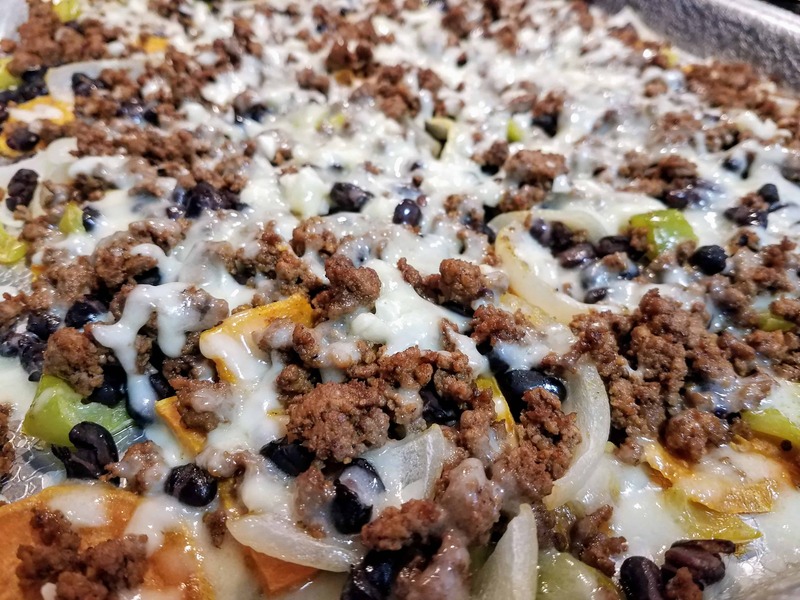 When the nachos are finished baking, remove the baking sheet from the oven. Add the beef mixture on top, top with both cheeses and return the baking sheet to the oven for an additional 5 minutes, or until cheese is melted. Remove baking sheet from oven. Serve topped with any toppings you desire, such as salsa, sour cream, guacamole, etc. Enjoy! Lord have mercy this looks like heaven! I definitely need to get to the grocery store and grab these ingredients to make some of my own! This is a great way to incorporate sweet potatoes into a super popular meal. The sweet potato nachos are so much more healthy for us than the regular nachos. This dish has it all . Great taste and contrast for the palette and also the healthy option side of things. What a twist!!! Somehow looking for a recipes of sweet potatoes and found this one!!! 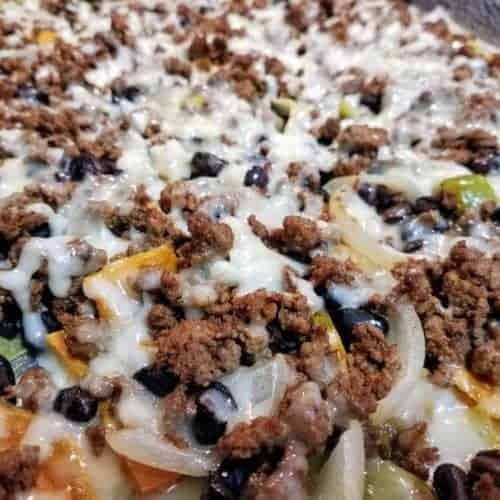 Superb nacho dish!!! 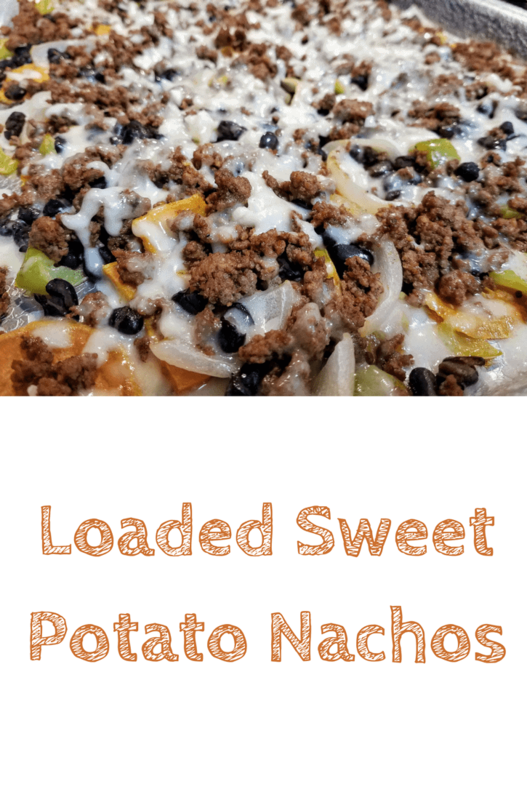 I never thought of using sweet potatoes as a base for nachos before! This recipe looks so good and it’s definitely worth trying! Thanks for sharing this! Loaded sweet potato nachos? Well, the name sounds as good as the dish itself! It looks so yummy and as much as it sounds new to me, I’m certain it is delicious…especially that they have sweet potatoes which are my favorites! Yum!I really love nachos and I have never had potato nachos yet . And you used loads of cheese which is my another favorite I’m so gonna try and make it .